Just a few days after Sara’s 95th April Fool’s birthday, it’s time for a bungalow-to-cabin update. 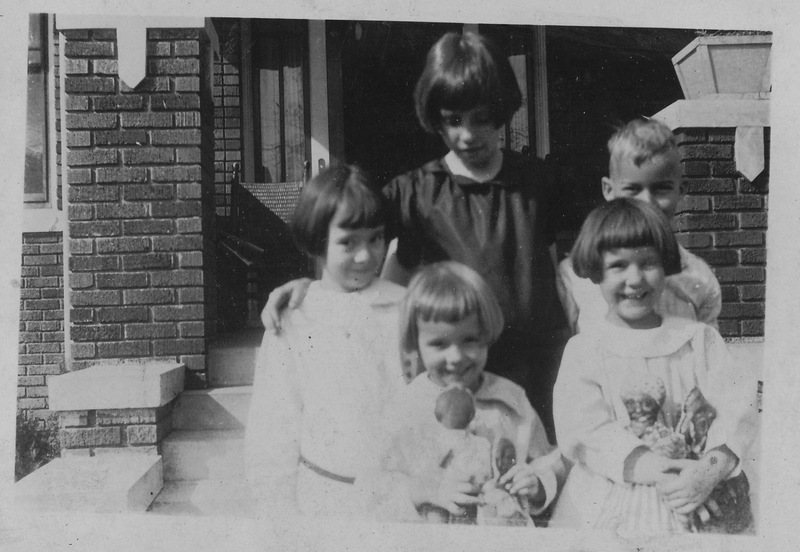 There she is, second from left, with Mamie, Tiny and a neighborhood buddy. Looks like they’re all in homemade outfits, on a spring or summer day, posing for Howard’s camera. I don’t know anything about their little friend’s later personality, but the Evans girls are already showing their adult quirks. Mamie looks like she’s going to burst out laughing at any moment, Tiny is intense and obviously the one in charge, and Sara finds the whole moment just a bit ridiculous. The critical detail in this photo is just to the girls’ left. 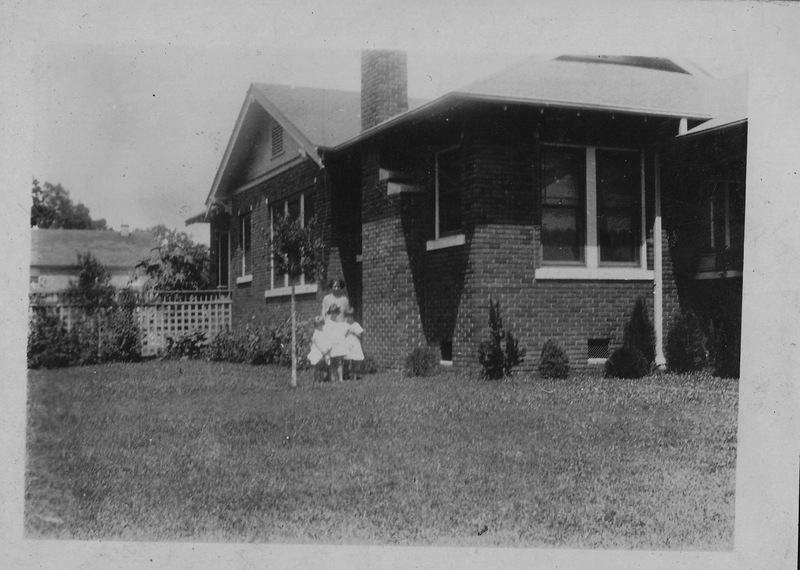 That odd white structure in the brick porch wall is a concrete downspout, one of two that were inserted in the wall when it was built in 1922. Their intended purpose, I’m sure, was to carry rainwater away from the porch floor, a clever device that I’ve never seen anywhere else. But it was their unintended use, dreamed up by swimming pool-averse Jessie, that made those downspouts a must-salvage element for me as we demolished the bungalow. One of my favorite Sara stories was her recollection of sizzling summer days on Strong Avenue, when Jessie would plug up the downspouts and flood the front porch with the garden hose. The girls could splash and spray to their hearts’ content and then Jessie would pull the plugs away and let the water drain off into the flower bushes. Having lost a younger brother in a Moon Lake drowning incident in 1919, she kept her flock as far from pools and rivers as possible, and this was her one concession to children’s natural attraction to aquatic play. Sara never forgot the fun of those days, but she also never learned to swim. We had exceptional brick masons working on the new cabin at West. They took those thousands of thick, solid brown and white bricks and recreated the look and feel of the bungalow with amazing skill and craftsmanship. When it came time to build the “bungalow porch wall,” I showed them the downspouts and where I wanted them placed. Mr. Steelman scratched his head, took some measurements, and said, “We can do it, but they’re not going to be open all the way to the back side,” giving me one of those “Uh, oh, crazy woman with nutty demands developing here” looks. I told him that the back side was irrelevant, but I wanted to see those downspouts poking out of that wall every time I drove up to the cabin. And in they went. That’s the west side, and the other is just around the corner on the south side. We only get out to West about once a week, so there’s always a surprise waiting for us as William Buckley’s crew takes parts of one old house and creates a new one. Most times I just wander and stare and marvel at their work. But sometimes I get downright teary as I watch the bungalow bits come back to life. The first glimpse of the downspouts was an emotional moment. The next will probably be on the day we walk down the hill and see this century-old door in place. I cherish this entranceway as much as any part of this unusual puzzle. When I would peer through it on Strong Avenue, it was so easy to imagine small girls peeking out, waiting for their dad to come driving up or watching for friends who might drop by. I picture my grandparents, keys in hand, unlocking the door for the very first time into the only home they would ever own together. I can see Christmas wreaths and lace curtains and smudged little fingerprints on the glass, all part of the life that Sara’s family lived there from 1922 to 1929. It is truly an opening into a lost world, a reminder of such a brief time that meant so much in the lives of all those children. 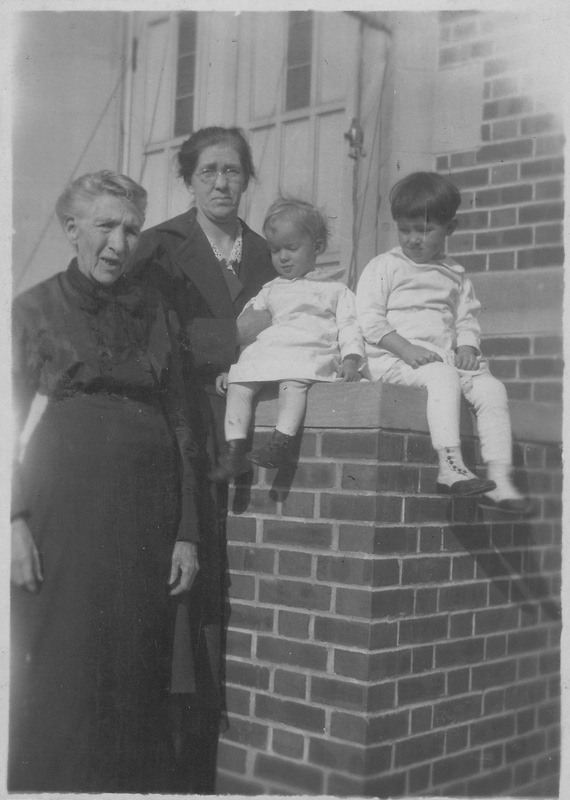 Mamie, Tiny and Sara on the bungalow steps. The door behind them was painted a dark color and had a screen door in place at that time. 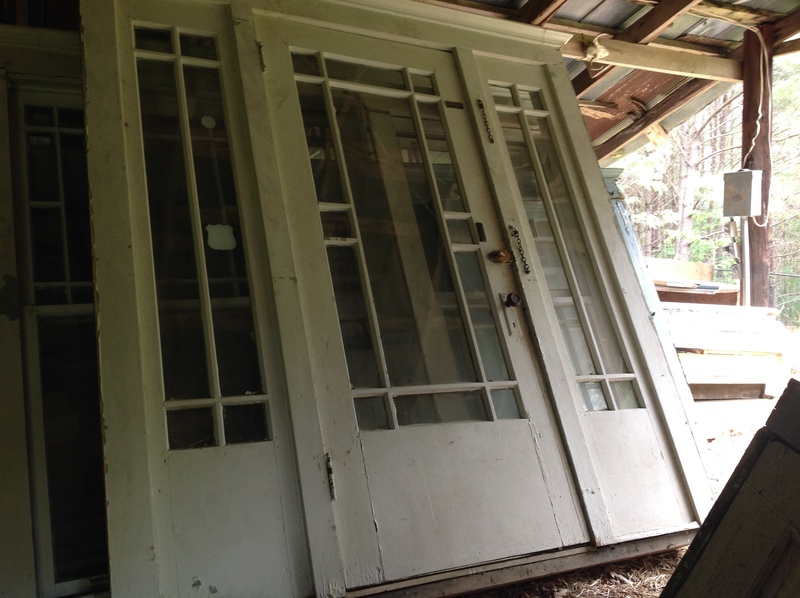 The screen door is at West, as well, and will anchor the entrance to the screened porch. After years of dreaming and planning and tearing down the Strong Avenue bungalow, watching a beloved home vanish and wondering about the wisdom of deconstruction, we’re reached the stage where our carpenters are shoring up the 94-year-old Craftsman-style windows and slipping them into place at the Holmes County cabin. It’s been a tough journey for these old beauties, and they’ve not all survived. 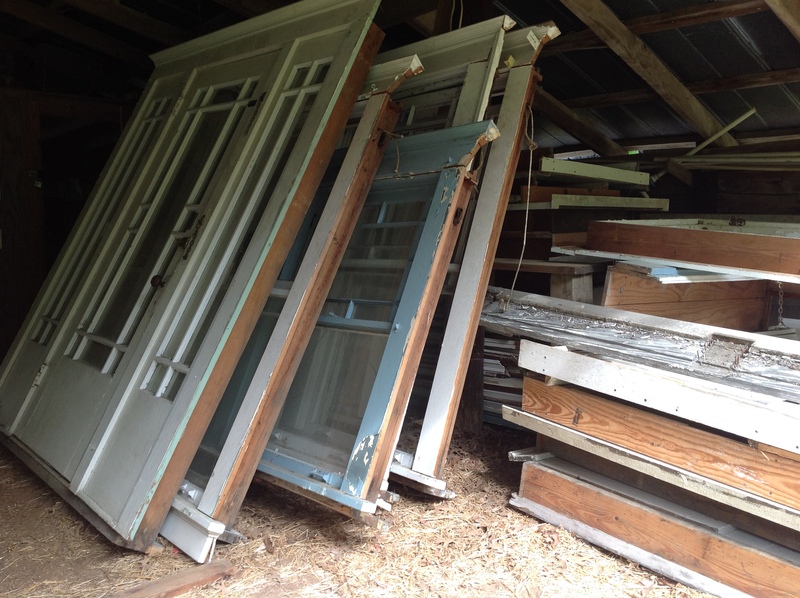 Some lie in shambles in the shed yard, their clouded glass in shards and their wood warped beyond salvage. Others are essentially intact, looking just as they did when Howard gathered his chicks in the side yard in 1925.
Who knows what shielded the bungalow from destruction? Nature was taking its slow and steady toll, as shingles rotted and mortar cracked, but that is the same with the 15-year-old house I live in today. But when I saw that broken window, the artwork of someone with no conscience, just a rock and a strong arm, it struck a nerve. Once the elements and the bored have access to an interior, it’s all over; I’ve seen it time and again all over Mississippi. It was time to fish or cut bait. Miles Dickerson magically moved every brick, beam and rafter, by himself, from Greenwood to West. The only task that required the help of his brothers was transporting the windows. They are massive, elegant, perfectly proportioned and graced with those thin strips of decorative wood that speak of the early 1920s, when an ambitious young man could build “the first brick bungalow in Greenwood” for his bride. Those windows poured light into the house, especially on the west side, into the two bedrooms where Tiny, Mamie and Sara woke up each day, and the living room where they played on the floor with their paper dolls and tickled their baby brother, Howard Evans, Jr. They kept the rain out on gloomy days like today. They provided a safe spot to keep an eye on eccentric Miss Pearl McClellan and her even-more-eccentric mother, living next door in a truncated section of Greenwood’s oldest home. They overlooked games of tag and hide-and-go-seek and tea parties and somersaults. 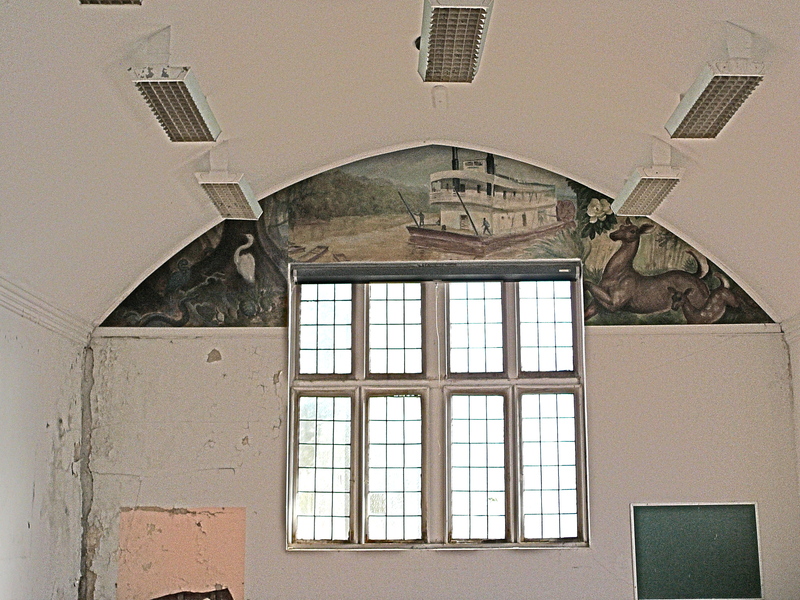 And now those wonderful windows are finding new life in the cabin at West. The whole shebang was designed around them, so once again they serve a serious purpose, much better than the sad fate of targets for rocks and bricks. The dark bricks that outlined them for nine decades will be mortared back into place and we’ll shine their panes up with Windex and elbow grease. Those shown here will look out over the woods on the north side of the cabin; the main bank of windows will look over a screened porch and the lake. Not such a bad outcome for a set of city windows, is it? There may not be tea parties and doll houses out in those woods, but I plan to see my grandchildren “bear hunting” and tree-house building and exploring those woods in the years to come. And I hope their grandchildren will pester them to tell them the story, just one more time, of a little girl named Sara, who lived so long ago, who shared her memories of a special place and a magical childhood and set this whole amazing story in motion. 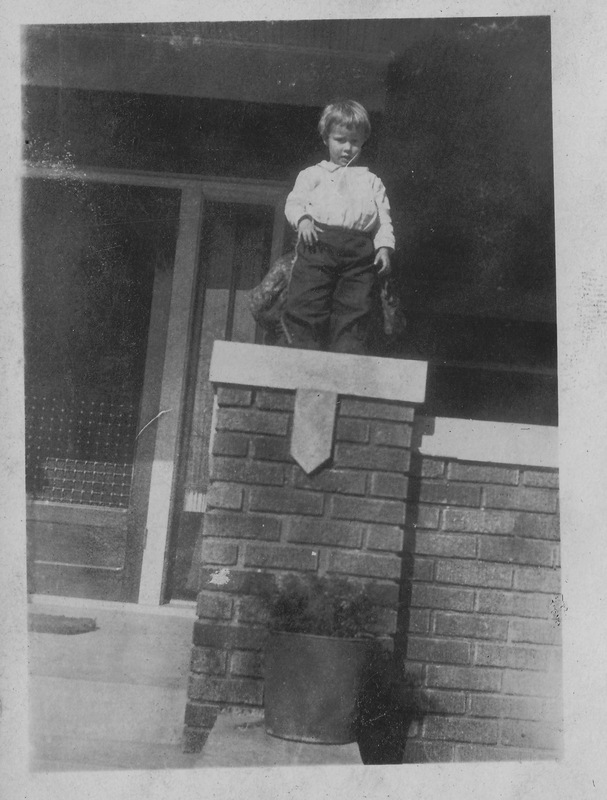 One of my earliest memories, as a child growing up in Greenwood, was a set of concrete steps on an empty lot, southwest corner of Grand Boulevard and Monroe Avenue. I was fascinated by those steps, the incongruity and loneliness of one small part of a house left behind, a tangible memory of something that once was and now wasn’t. Sara and I drove by there almost daily, as it was such a busy intersection, and I would beg her to pull the Plymouth over and let me out to sit on the steps. Being the agreeable mother that she was, we did that a lot. Passersby hurrying down the Boulevard must have wondered about us, the lovely young mother in a stylish dress and the dark-haired, rumpled little girl, usually in scuffed-up cowboy boots and jeans. We’d just sit and talk about the house that had once stood there and the people who lived there and the memories they must have carried off somewhere else. I suppose this was the beginning of my long fascination with lost mansions and hidden treasures and the slow march of time which eventually erases all traces of so many beloved structures. I never dreamed I would be the instigator of a house’s destruction, even for such a good cause as a family cabin in the Holmes County woods. I have watched 1212 Strong Avenue, the Evans bungalow, quietly vanish for almost a year now, and last week wrote the final chapter of that emotionally challenging tale. We salvaged every brick possible, reclaimed acres of lumber and carried away the capstones and lintels and windows and doors from another time. 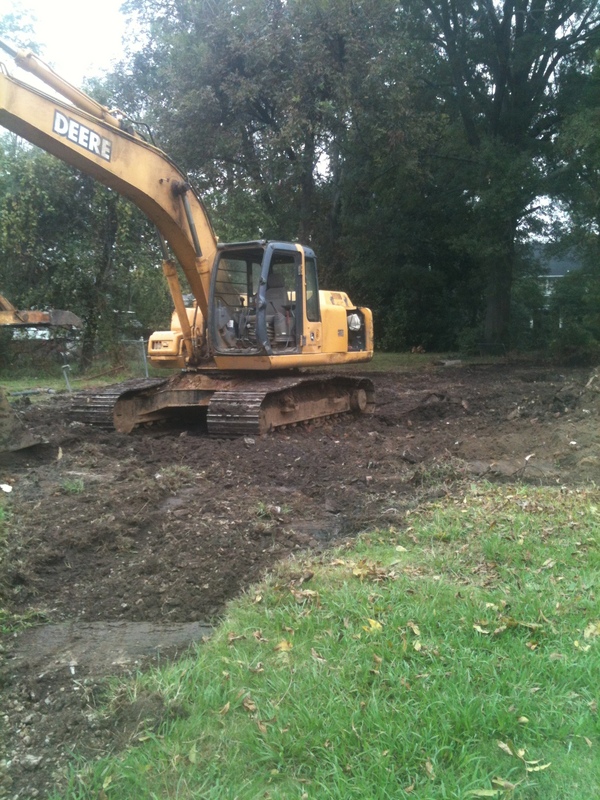 Work has begun on that Holmes County hillside, an outline of the new cabin born from the old bungalow. That’s exciting, but I can’t shake the sadness of seeing an empty lot where there was once so much life and laughter and hope. The steps were the last to go, which seems ironic in light of those talks Sara and I had on the Grand Boulevard steps so many years ago. I made several trips back to Strong Avenue while waiting for the bulldozers to come, and I tried to hear the voices of the children who played there on November days in the 1920s. What is it about a collection of bricks and mortar and porches and attics and windows that makes a house memorable? Piled up in our shed at West, they don’t look like much, just random bits of building material permeated by a faint whiff of age and decay. But when our builders refinish the lumber and slot the bricks into place, all that “stuff” will magically become our home, our children and grandchildren’s home, a place that, I pray, will be filled for generations with joy and love and devotion to family. 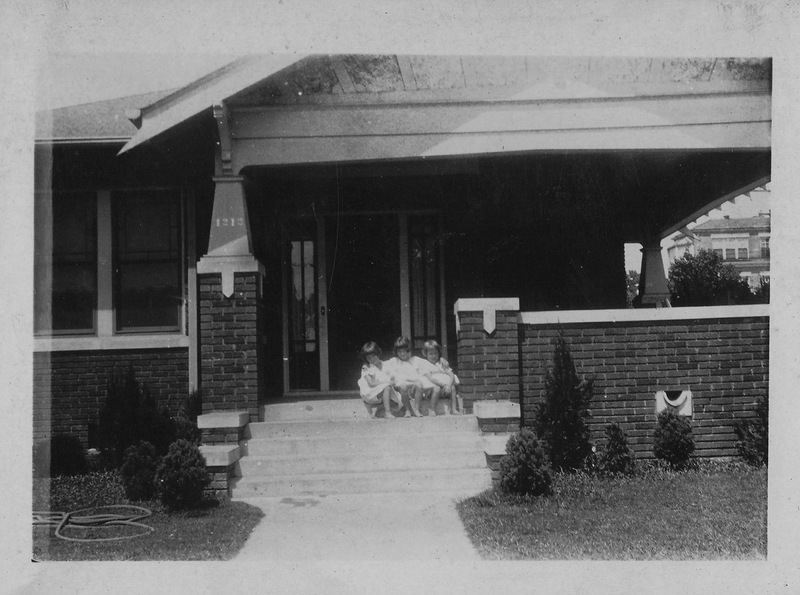 Just as it was on Strong Avenue, when Howard and Jessie built a home for their three little girls. Just above, there are those steps again. They were too heavy to carry to West, and I deeply regret that. The concrete downspout was saved, and it will be worked into the new porch. Maybe I’ll pull a hose out and make the porch a swimming pool one day, just as Jessie did for her kids. So what happens to discarded steps? This is bordering on silly, but I hope they went straight to Step Heaven, where Jessie reclaimed them and gathered her girls around her once again. After almost a century, they’ll be littered with dolls and marked up with chalk and the place of jacks games and hopscotch and dreams. That would make all of this worthwhile. As the 6th anniversary of Sara’s death approaches, the poignancy of watching the place of her first memories disappear is often overwhelming. It’s taken more than 8 months, starting with the careful disconnection of light fixtures back on a bitter January morning, continuing through a spring that brought almost unbearable sadness for our family and on into the never-ending weeks of summer, with its relentless sunshine and only a vague recollection of rain showers. We’re down to just days now, as floorboards come up and foundation dirt blows about in the hot wind for the first time in almost a century. I would love to find a bit of Sara or her sisters in that dirt, maybe a long-lost doll or a tiny playhouse dresser or even an old leather shoe. Chances are slim, I realize, but that would be such a final gift from a house that’s given so much. 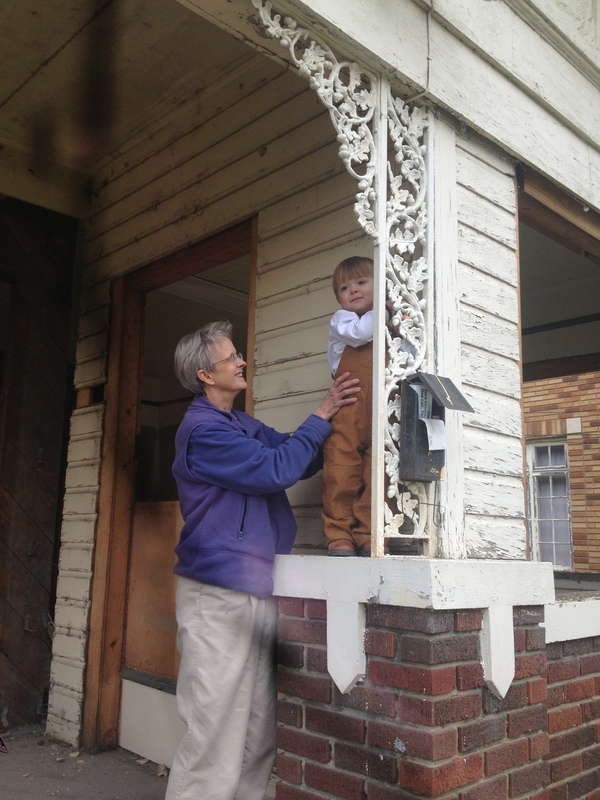 This week, our friend, Miles, who has treated this old house like he would his own, will start pulling down the front porch bricks. At some point, he’ll carry away the very ones underneath Mamie, Tiny and Sara in this Christmas, 1923 photo. Three little girls, under the watchful eyes of their great-grandmother, mother and grandmother, happy years ahead for all of them, with another five or so to be spent in this very bungalow. They’re all gone now, all missed, none more so than Sara, who lived an eventful, memorable life that no one could have ever imagined on that December day. I think these six ladies would like what’s going to soon be rising in the woods of Holmes County. Bigma and Bama, because it will be close to their own homestead at Durant; Jessie, because the “new” house will echo the lines of the Greenwood bungalow; Mamie, because the whole project is just nutty and outrageous and the kind of thing that would make her laugh; Tiny, because she loved nature and the countryside and the way houses could fit into a special space; and Sara, because the stories she told us of life on Strong Avenue will now be passed down to generations to come. Almost gone……almost ready to be reborn. Since it’s too hot to breathe outside, perhaps this is a good day to stay in and post an update on the bungalow demolition. 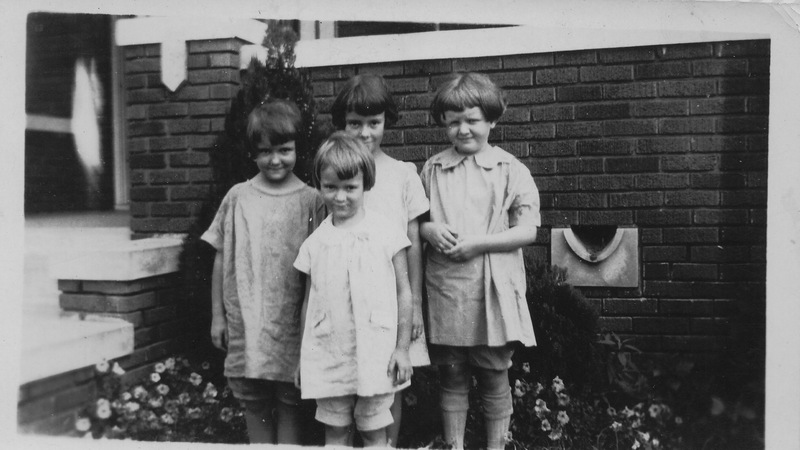 I’m grateful for air conditioning and my study’s ceiling fans, luxuries which Jessie didn’t have when she likely sent these three out into a steamy Greenwood summer day, 1926, telling them to play paper dolls on the porch or hopscotch on the sidewalk. I wonder if she was in the kitchen with Bama, baking teacakes and fixing the girls lemonade, or perhaps she had carved out a bit of time just for herself, to read or listen to her favorite radio shows. And who knows why Sara is clutching a pillow; in most of this era’s pictures, she’s wagging around a raggedy doll or a book. Maybe this was a foreshadow of her adult years, when her preferred spot was her big bed, whether she was making bottle dolls or mixing up cake batter or writing a story for the newspaper. I’ve never known anyone who could accomplish as much in a semi-recumbent position. 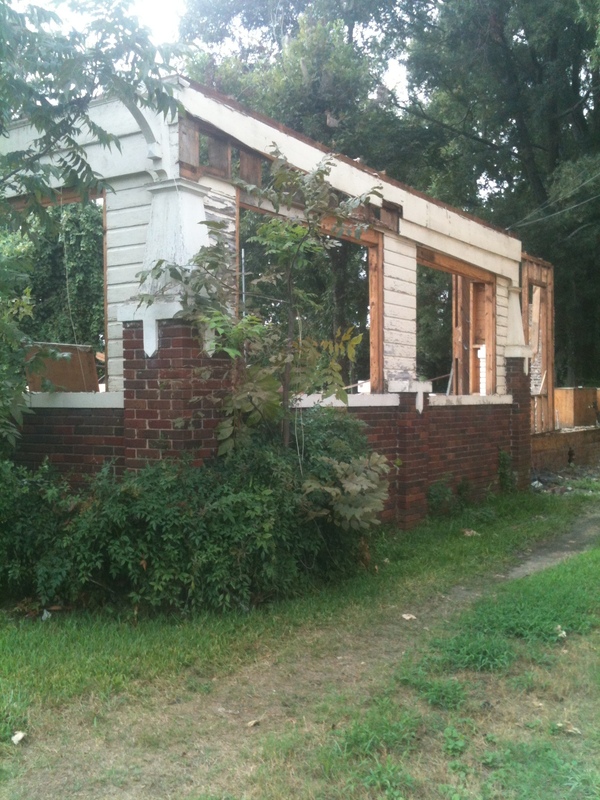 1212 Strong Avenue in early July, 2015, just a shell now. Back to the bungalow: Day by day, it vanishes from Strong Avenue, moving brick by brick and beam by beam out to Holmes County. 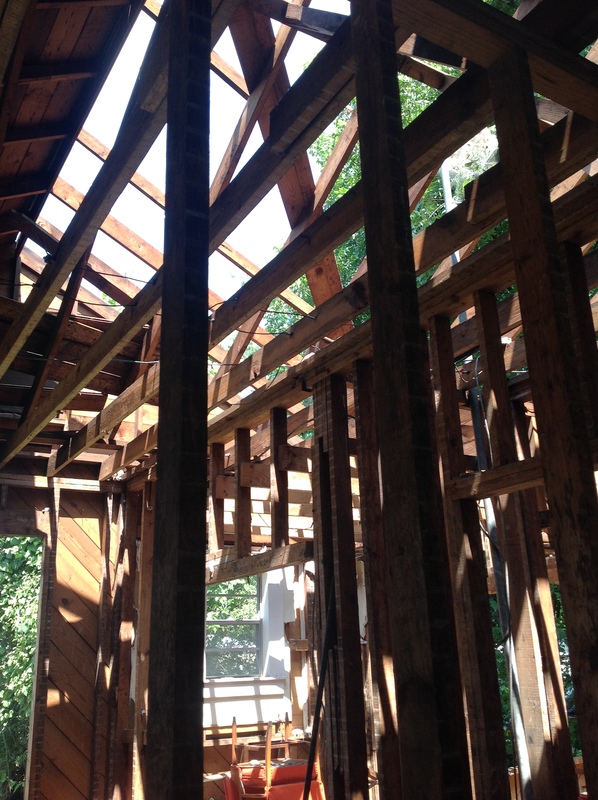 The roof is about 1/3 gone, revealing attic rafters and joists that were fashioned by carpenters nearly a century ago. Their craftsmanship continues to amaze us as each layer of the house peels away. The chimney is coming down this week, leaving dark mortar and soot in the high grass of the lot. 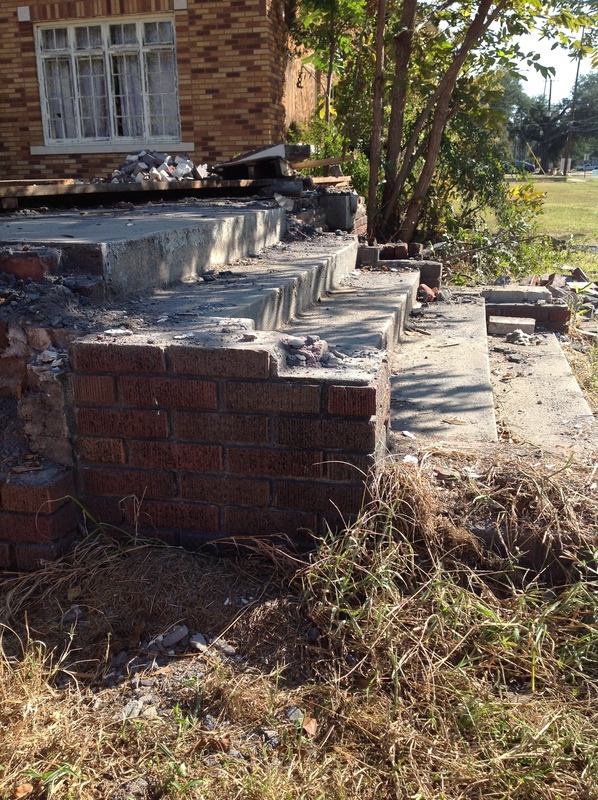 There’s not much left to deconstruct, mainly the porch bricks and the floors, and then we’ll be ready to call in the bulldozers to finish it off. That will be a tough day, and one when I will once again wonder, as I do so many days, whether I have properly honored my grandparents in this crazy venture. Our farm shed is packed with doors and windows and sash weights and lintels and molding now; along the fence are 6000+ bricks, looking as if they emerged from the oven just last week. Architectural drawings cover our dining room table, plans for that old wood and those perfect bricks and generations of memories to be reshaped into a “home in the woods” for our children and grandchildren and their children and grandchildren. I’ve dealt with old houses all over Mississippi, everything from elegant to ruined, for a very long time. Some are saturated with the spirits of those who built them and loved them, a very palpable presence that is in no way frightening or unnatural. The bungalow, happily, is one of those houses. And I’m delighted to say that whatever Evans family influence marked it as a place of joy in Greenwood has survived the piece-by-piece trip out to West. There’s just nothing like turning a doorknob which your mother turned with little sticky fingers in 1925 or looking through the window which your great-grandmother raised to call the girls in for teacakes. The circle is, for sure, unbroken. 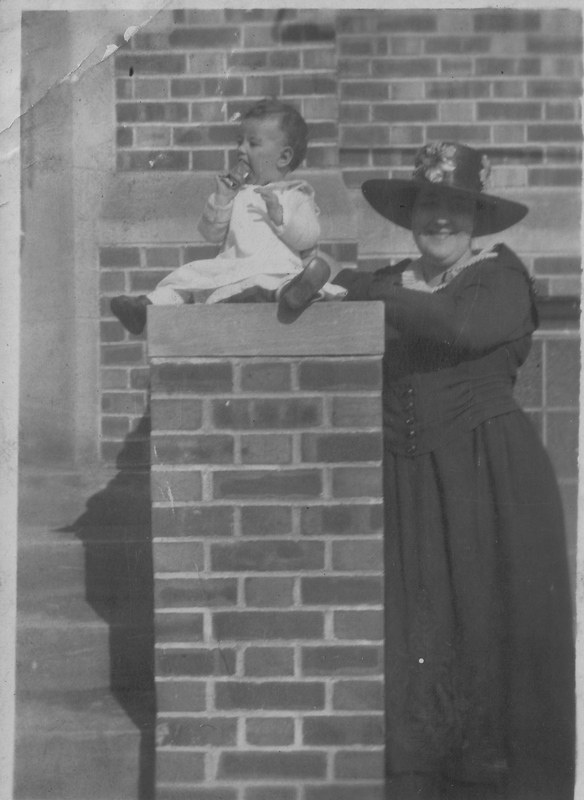 Jessie West Evans with her first daughter, Jessie (“Tiny), on the steps of the Greenwood Leflore Public Library. 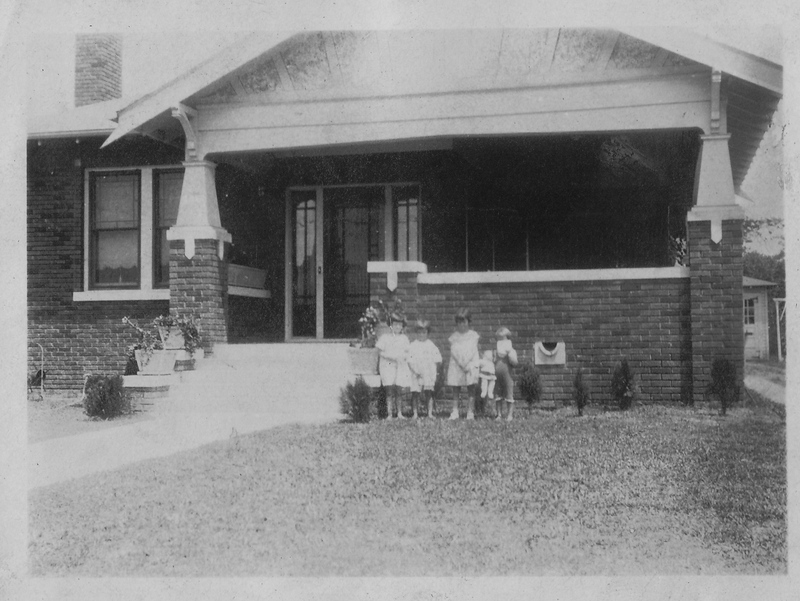 Continuing our exploration of Greenwood’s historic architecture through Sara’s photo collection, we’ll look at a building that meant the world to three generations of this family. On a bright Sunday morning, just after church at First Methodist, Jessie proudly props Tiny up on the steps outside of the Greenwood Leflore Public Library. Tiny was born in the spring of 1918 and appears to be about 8 or 9 months old; other photos taken that day show the trees bare and everyone in dark clothing, so it’s likely in November or December of 1918. At that time, the Evanses were living right across West Washington from the library, so this lovely public building was a logical site for Howard to pose the ladies in his life for a few snapshots. Margaret Sproles Chavis Alexander (“Bigma”), Theodorene Chavis West (“Bama”), Roy Stott, Jr. (“Buddy”) and Rena Stott (“Rawa”). 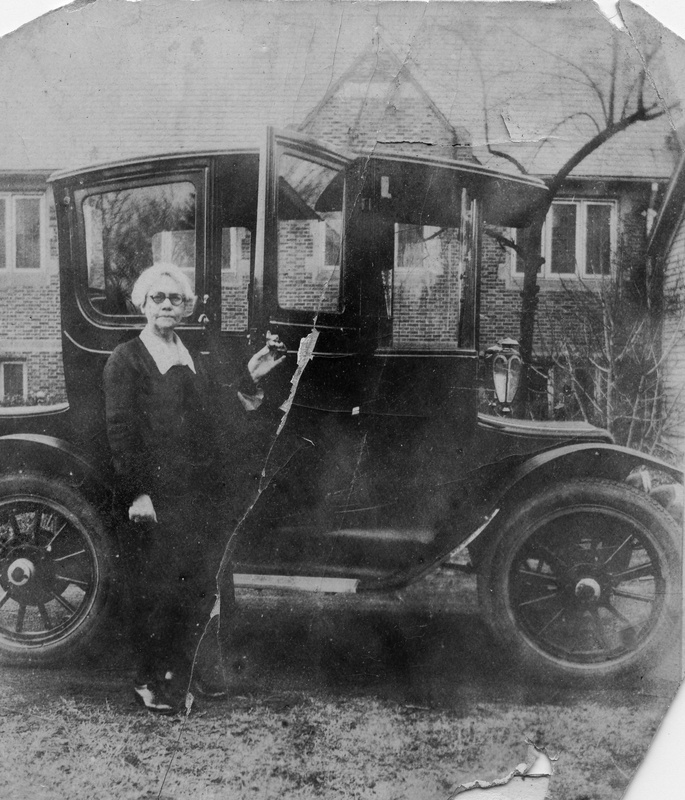 Lizzie George Henderson with her 1912 Detroit Electric car. The original east facade of the library is seen behind her. Lizzie George Henderson was the youngest child of Carrollton’s Senator J.Z. George; she grew up at Cotesworth surrounded by servants and books. 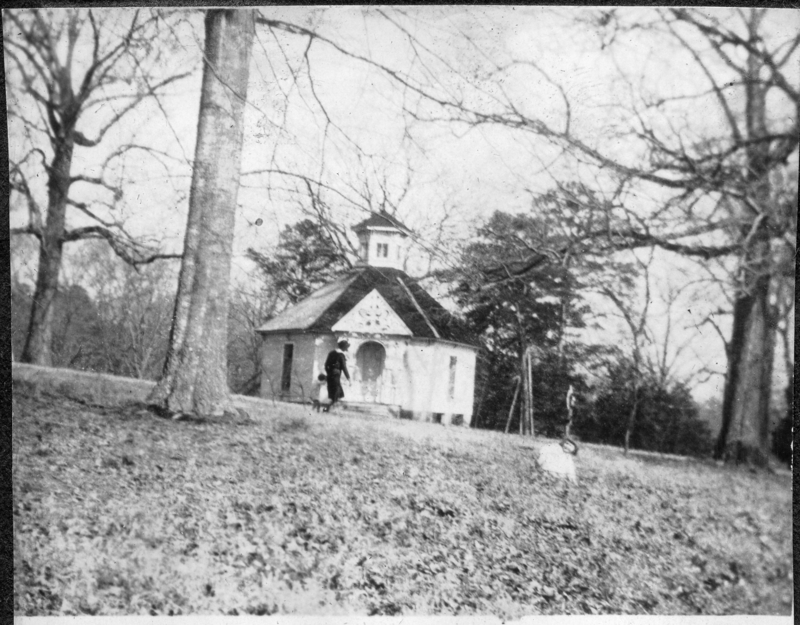 When she married Dr. T. R. Henderson, she moved down to Greenwood and set about remaking her adopted town in her own image. Miss Lizzie was a force to be reckoned with: National president of the United Daughters of the Confederacy (at a time when “Lost Cause” organizations wielded enormous clout), local founder and president of the Greenwood Woman’s Club, pillar of the Baptist Church, etc., etc. When this fierce lady set her mind on a project and lined up her Woman’s Club and church buddies behind it, it was going to happen. Their husbands learned to smile, nod appreciatively, hand over their wallets and get out of the way. The Hendersons lived in an enormous two-story white house on the northwest corner of West Washington and Cotton streets. And they owned pretty much all of the real estate within walking distance around them. In 1910, they donated most of a city block for a new First Baptist Church and funded much of the construction personally (more on First Baptist Church and its unfortunate demolition in posts to come). Just across Henderson Street (wonder who that was named for? ), Lizzie oversaw the construction of the Confederate Memorial Building in 1912. She had seen a similar tribute in Richmond, Virginia, and was not about to have Greenwood overshadowed in commitment to the men in grey. She wanted a Memorial Building, she had the clout and the money, and Greenwood watched the nation’s second CMB rise across from the church. 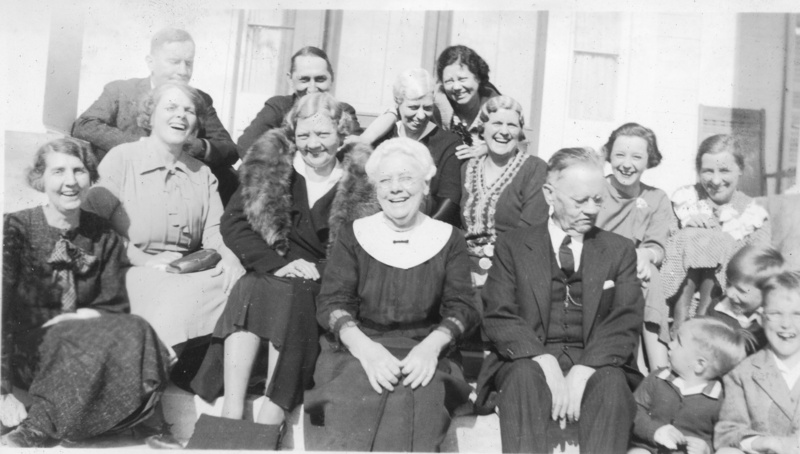 A laughing Lizzie George Henderson, middle front row, on the steps of her father’s home, Cotesworth. Pictures of Miss Lizzie smiling are very rare. Now there was a large lot left behind the Henderson home and its outbuildings. Miss Lizzie looked around, noticed that the only access to books was a tiny lending library in a riverfront general store, and decreed that Greenwood’s next big project would be a Carnegie Library. Pity the Carnegie Foundation. This philanthropic arm of Andrew Carnegie’s estate had built libraries all over America, but it’s a sure bet they had never encountered anyone quite like Lizzie George Henderson. She charmed them right out of $10,000, promising to have the City of Greenwood match that amount. When the city could only come up with $8900, Dr. Henderson pulled out his checkbook and made up the difference. In the fall of 1914, the arched doors of the library opened to eager readers, who found almost 1000 books already on the shelves. And where had the books come from? 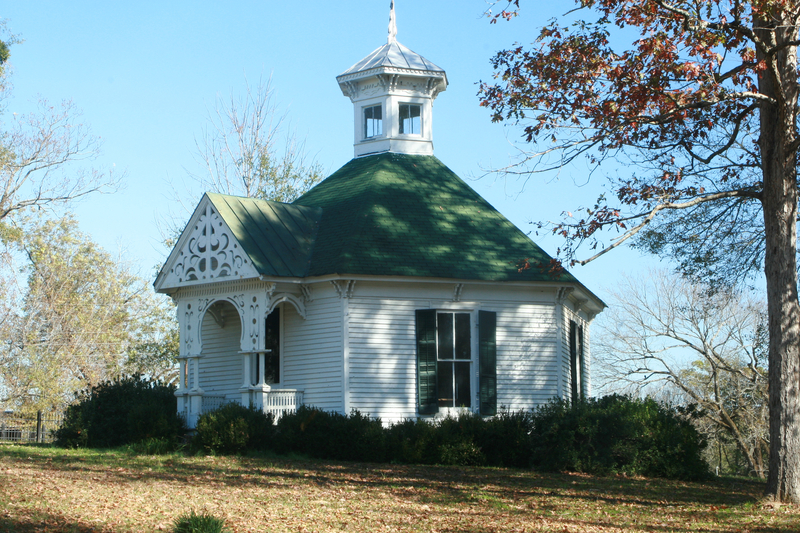 Lizzie sent her oldest brother, Cot George, up Valley Hill to Carrollton in a wagon and instructed him to pull as many books as he could off the shelves of the Cotesworth Library. Translation: This is one stunning public building. And what those dry descriptions don’t capture is the warm and welcoming environment which was always a characteristic of this library. 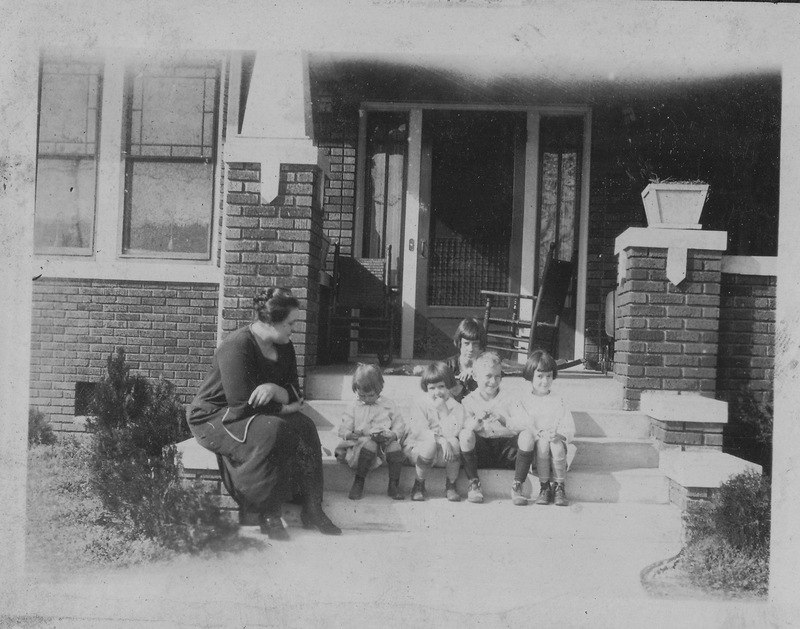 Jessie and her children spent hours and hours there, poring through picture books and the latest novels and leafing through magazines, instilling in those children a love of reading which stayed with all five of them through life. It was my favorite destination, better even than the Paramount or the City Pool, because I could lose myself in all those endless shelves of adventure and science and mystery, overseen by the kind Dorothy Hayes. I don’t know for sure if Bigma and Bama availed themselves of its treasures, but I know my Great-uncle Roy Stott walked there almost every single day after his retirement from Greenwood Utilities, carrying a grocery bag full of westerns home to read in his big overstuffed chair at 115 East Washington. The old library celebrated its 100th anniversary last year, but the cake and accolades were found across the street in the 1979 building, not in the sadly neglected Carnegie building. It’s been rarely used in the past 36 years and stands waiting for a purpose and for life to pour back through those wonderful doors. 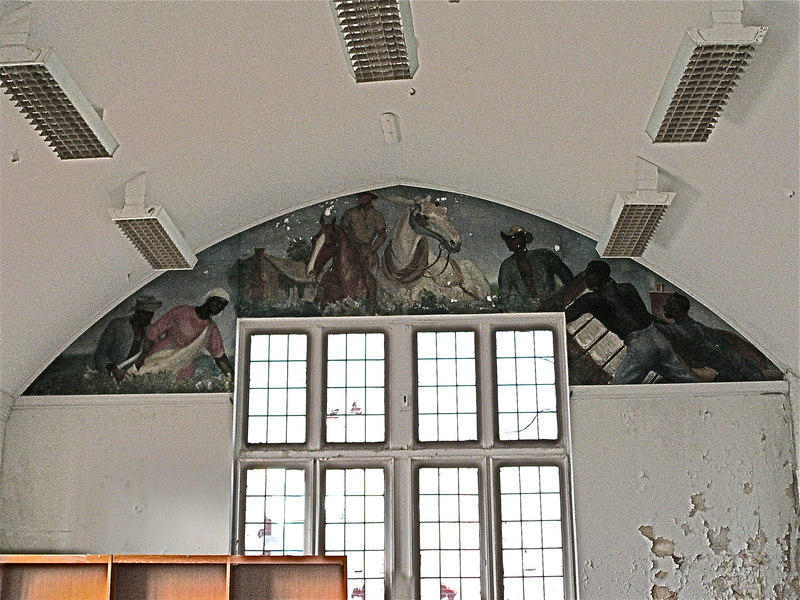 Lallah Walker Lewis’ murals, which watched over the children’s room from 1937 until just a few years ago, are restored and crated up in the courthouse, just waiting to be put back over those casement windows. Lallah Walker Lewis murals, south wall. Lallah Walker Lewis murals, north wall. 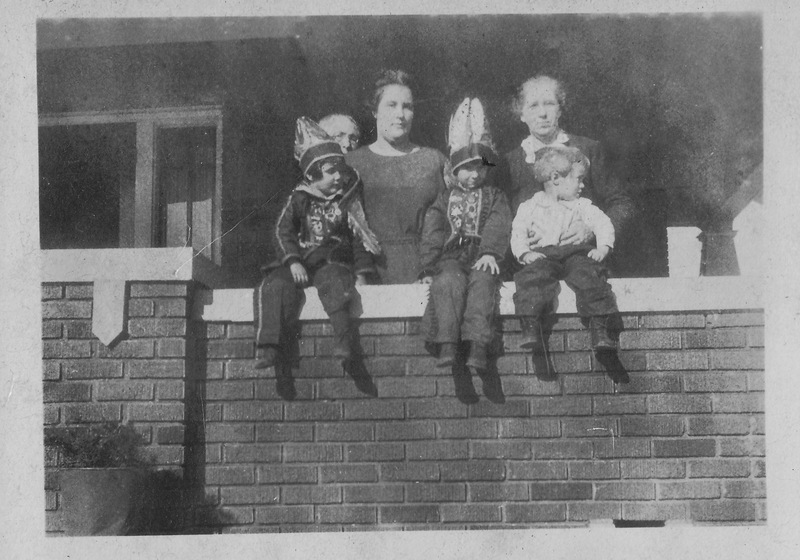 I think of my grandmother, Jessie, and Bama and Bigma when I ride by the library, trying to picture them posing with those small children on that 1918 Sunday. I suspect that these women, who grew up in rural Holmes County with very limited access to books, much less outstanding architecture, would have one question for us as a community: “How did you let this happen?” And we don’t even want to imagine what Miss Lizzie would have to say. I hope to never, never run into her ghost in that library.